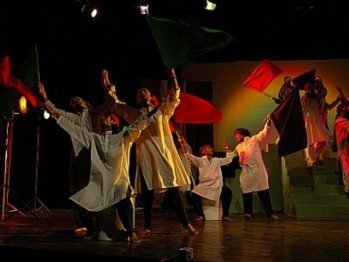 LAHORE – Ajoka Theatre, in collaboration with Lahore Arts Council, will stage a play Hotel Mohenjodaro on April 19 (Tuesday) at Alhamra Arts Centre. Directed and adapted by Shahid Nadeem, Hotel Mohenjodaro is based on a short story “Dhanak” written by Ghulam Abbas in 1960. It is generally accepted that great writers can at times be prophetic and their fiction can predict future reality. This story is close to the troubling reality of present day Pakistan. It is hard to believe that a writer could have foretold it with such uncanny accuracy almost half a century ago, said one of the organisers. Those to act in this play include-Sarfraz Ansari, Imran ul Haque, Usman Raza, Furqan Majeed, Asif Hassan, Shezad Sadiq, Tazeem Sadiq, Saima Ghouri, Raheela Yousaf, Nadeem Abaas and Yaqoob.